Now, if you go back to the waterfall page, you will see that the project's name is whatever you may have changed it to and when you click on the the URL of the project name at the bottom of the page it should take you to the link you put in the configuration. 2009-08-01 13:52:23+0200 [-] The new config file is unusable, so I'll ignore it. 2009-08-01 13:52:23+0200 [-] I will keep using the previous config file instead. 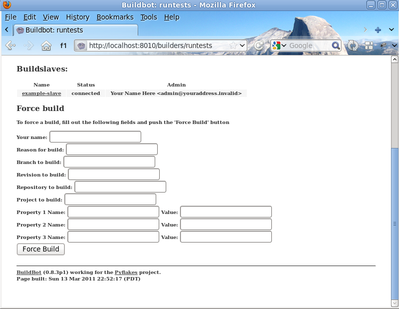 Type in your name and a reason, then click Force Build. 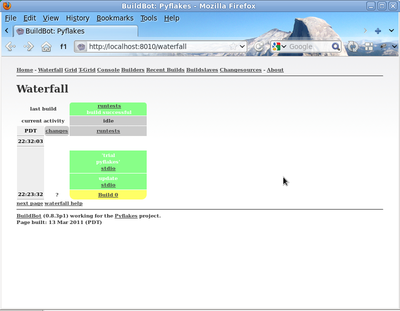 After that, click on view in waterfall. 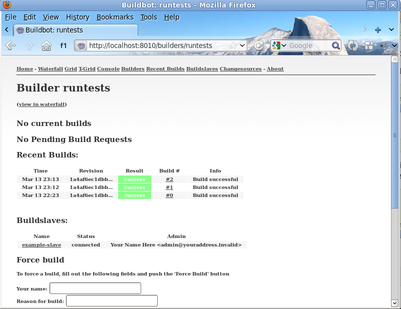 Edit the config and look for the STATUS TARGETS section that you changed before to be able to force the build.